In a recent article written for the Lehigh Valley news located in New Jersey, reported a high-end fitness club with plans on incorporating a waterslide. Why would a wellness center include a waterslide? The question should be, why wouldn’t it? Waterparks across the country aren’t necessarily ideal for kids. Adults can benefit from these types of physical theme parks as well. After all, spending a day swimming, and climbing and even sliding down a waterslide can lend to some serious calorie burning activity. One person claims to have burned over 1,056 calories from a full day spent at a waterpark in Portugal. Waterparks and waterslides in general help to tone all the major muscle groups. This exercise targets ABS and helps to improve cardio fitness, balance and stamina. Just 20 minutes of bouncing up and down, then climbing stairs and sliding back down can burn almost 400 calories. *The Title Boxing Club recently wrote a blog claiming that waterparks are an ideal way to lose weight. They also made remarks that performing the same activities on dry land isn’t as effective as it is underwater. 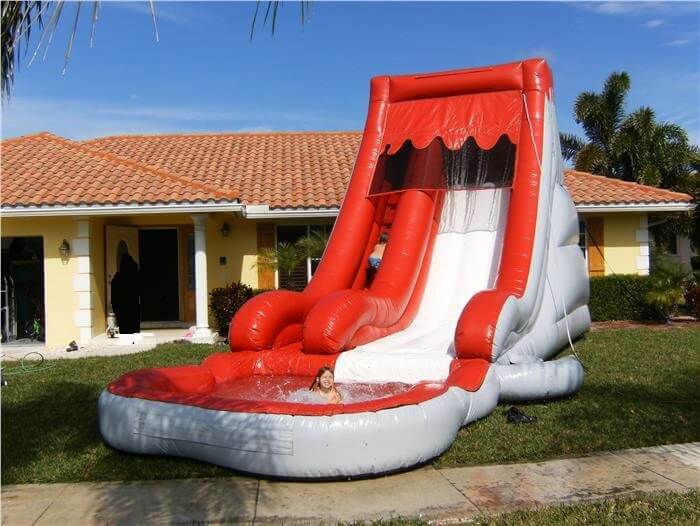 For children that tend to be a bit on the heavier side, can really benefit from a day of waterslide fun. While they’re playing and hanging out with their friends, they don’t even notice they’re staying active and becoming more in shape. Although Fitbit Trackers are not entirely water resistant, you could track with waterslides where you aren’t fully submerged in the water. The waterslides you find at events, such as kids birthday parties aren’t going to cause damage as long as you have one like the Fitbit Surge which is meant for water. Swimming in general can allow up to 413 calories to be burned in one hour. This is of course with someone who is around 130 lbs. or lighter. The heavier the weight is; the less calories are burned. Swimming is one of the best forms of exercise since it’s easy on the joints, low impact and much cooler than running in the hot Florida sun. We found a good swimming calculator to help determine how many cals you are burning while swimming. Since waterslides aren’t quite the same, this calculator will be off. Add about another 20 calories for running, climbing stairs, treading water and then kicking legs, or any other movement you do when going up and down the waterslide. With all this information, one can only assume that waterside activities are aerobic and will help you lose weight. We’d like to hear from you, if you found it a bit of a workout when you rented one of the inflatables. Drop us a line and tell us how many calories you burned while having some South Florida Bounce Fun! For rentals, contact our fast and furious staff!